Tablet sales are exploding in the last couple of quarters and the last three months of 2011 were no exception - there were 28.2 million tablets shipped worldwide, according to IDC research. Interestingly, though, while the iPad had record sales of 15.4 million units, the exploding growth of other slates led to Apple’s tablet sliding in terms of market share. In Q4 2011, the iPad grabbed 54.7% of the market, down from 61.5% sequentially. This was partly due to solid sales of the $199 Amazon Kindle Fire which is estimated to have sold in 4.7 million units over the same period. This brings its share at 16.8% of the global market. Samsung was the other company gaining market share, but only slightly - it grew from 5.5% to 5.8% in the last quarter of the year. Barnes & Noble’s tablets sold well, but despite having more units shipped, the company’s overall share dropped 1 percentage point to 3.5%. Pandigital, a company selling affordable tablets, rounded up the top five tablet makers. Interestingly, IDC forecasts that Android tablets will eventually beat the iPad in terms of market share by 2015, but will remain less profitable. Hit the press release below for all the tiny details. 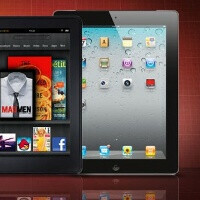 Worldwide media tablet shipments into sales channels rose by 56.1% on a sequential basis in the fourth calendar quarter of 2011 (4Q11) to 28.2 million units worldwide, according to the International Data Corporation (IDC) Worldwide Quarterly Media Tablet and eReader Tracker. That represents an increase of 155% from the fourth quarter of 2010. The market experienced stronger-than-expected growth across many regions and at many price points, leading to a full-year 2011 total of 68.7 million units. Based upon the markets’ strong 2011 finish, and the clear demand expected in 2012, IDC has increased its 2012 forecast to 106.1 million units, up from its previous forecast of 87.7 million units. Despite an impressive debut by Amazon, which shipped 4.7 million Kindle Fires into the market, Apple continued to see strong growth in the quarter, shipping 15.4 million units in 4Q11, up from 11.1 million units in 3Q11. That represents a 54.7% worldwide market share (down from 61.5% in 3Q11). Amazon’s shipment total put the company in second place with 16.8% of the worldwide market. Third-place Samsung grew its share from 5.5% in 3Q11 to 5.8% in 4Q11. Despite shipping more units, including its new Nook Tablet, Barnes & Noble saw its worldwide market share slip to 3.5% (down from 4.5%). Pandigital rounded out the top five, grabbing 2.5% of the market, down from 2.9% the previous quarter. As predicted, Android made some strong gains in 4Q11, thanks in large part to the Amazon Kindle Fire’s success (the Fire runs a custom version of Google’s Android OS). Android grew its market share from 32.3% in 3Q11 to 44.6% in 4Q11. As a result, iOS slipped from 61.6% market share to 54.7%; Blackberry slipped from 1.1% to 0.7%. WebOS, which owned 5% of the worldwide market in 3Q11, dropped to zero in 4Q11. Looking ahead, IDC expects Android to continue to grow its share of the market at the expense of iOS. Despite the strong growth of media tablet shipments, ePaper-based eReaders also experienced stronger-than-expected growth in the fourth quarter. That growth occurred thanks to sharp price cuts in established markets such as the U.S. and Canada, as well as increasing shipments in regions outside of North America. In 4Q11 the worldwide total increased to 10.7 million units, up from 6.5 million units in 3Q11. That represents a quarter-over-quarter improvement of 64.6% and a year-over-year improvement of 64.3%. IDC expects growth to continue in 2012 as major players such as Amazon, Barnes & Noble, and Kobo look to expand into new international markets. but it is not sold in other places.F***king amazon,why? Agreed if the kindle fire was available in most parts of Europe then the ipads market share of the tablet market would have seriously declined. the nexus tablet Will sure be released world wide and make a serious impact. The last few lines are very interesting where android tablets Will soon have the higher sales and market share but apple Will have the higher money gouging for profits,sounds exactly like the smartphone market!! Although the news regarding Foxconn could change that. Apple is going to be forced to deal with high labor costs and slower time to market. Foxconn has to hire thousands of more laborers, pay its existing workforce more to compensate for the lost over time or both. Labor is the second highest cost of goods sold after materials. With the way Apple gouges suppliers on parts, labor is probably its greatest overhead (or soon will be). I'm not so sure the company is going to continue to entertain the high margins it has historically enjoyed. It's funny how everyone wants apple to fail,when all they do is conduct business like everybody else. They just happen to be darn good at what they do. Apple,samsung,google,Motorola,Pepsi,coke,Chevy,Cad​dilac,McDonalds,and diterctv all want the same thing. YOUR MONEY,and the provide the medium to get it... Products,and services people,it's called big business also known as capitalism,and it's not going anywhere soon. I'm an apple guy,but I want to see google do as good as possible,cuz it forces apple to step it up n the process. If apple fails so does google,if google fails so does apple,cuz progress stalls n the absence of competition. believe me u don't really want apple to fail. U never want an industry leader to fail,jus get gut punched from time to time. Well say. I am an Android fan. Personally, I don't hate Apple, but it just annoys me when everyone who has no knowledge about tech wants Apple products. I got to the point I just want to hate Apple for no reason. However, Apple does offer amazing devices but iOS isn't my style. Android needs Apple, Apple needs Android. Without each other, the only people who are going to lose are us as consumers. Companies need competitors, that what makes technology to advance. Kind of silly reasoning. Apple has been around for awhile now. (I had an apple 2c back in 84) But you have to remember most people didnt get into computing until the internet took off in 1996. After that everyone had a home computer. It just wasnt delagated to gamers and college students any longer.But most people had just been using them for the internet.Now that the tablet market is exploding people who used their computers just for internet browsing will abandon the home computer. (home computers will become a niche market again at least until the tablet functions like a HC) But naturally all these people are going to go to the most popular format and name recognition. Really all they want is a stable internet device. Apple is delivering. I dont have any apple products right now but I am not going to belittle those that do.